For my first open source release of code, I bring you an Android Compound Control. 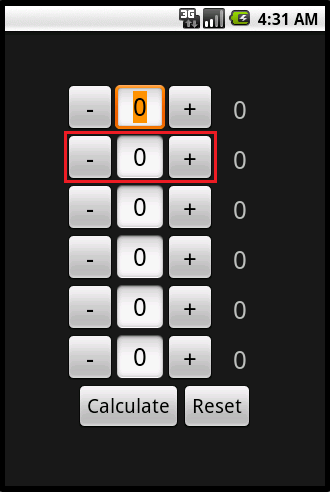 This particular custom control is a number picker with a repeat feature. This is a very basic control, but not one that is provided in the given pre-built control set. 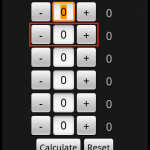 For those of you looking to easily fill that void, or perhaps learn how the auto-increment feature was implemented, I give you NumberPicker. There are two particular elements of this control I’d like to talk about. Firstly, is implementing the repeat feature. My first instinct when developing this was to spawn a thread to periodically change the value as long as a user held one of the buttons. I quickly learned that this wasn’t possible by simply spawning a Thread, as only the GUI thread can make changes to the GUI. Further reading in the Android manual led me to the use of Handler to schedule the changes. Whenever a button is long pressed, a flag is set, and a new Runnable, RepetetiveUpdater, is posted to the Handler. This new RepetetiveUpdater will check if a flag is set, and increment or decrement the value appropriately, and then post a new RepetetiveUpdater to the Handler with a delay of 50 ms. Once the user releases the button, an OnTouchListener checks if the the last touch action was the release of the active button and disables the flag originally set when the long click first occurred. The second thing I’d like to point out is how the parsing occurs for the EditText value from String to Integer. 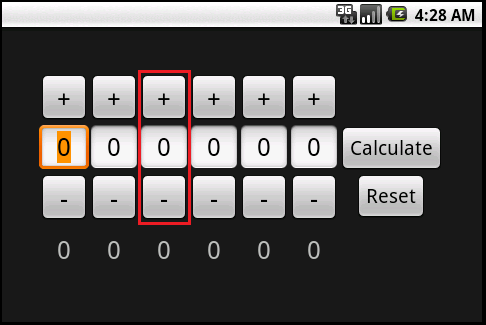 Much to my surprised, one utilizing a hardware keyboard can force non-numeric characters into an EditText that is configured to be numeric. There are two issues with this; we don’t want to crash trying to parse something that’s not an Integer, and we don’t want to have our number go up and away if a new line gets through. To mitigate these issues, whenever a key is pressed, an OnKeyListener will save the current valid value that was in place before the user pressed a key, attempt to parse the new text as is, and if it fails, restore the edit text to the last valid value. In this way, whenever a invalid key is pressed, the user doesn’t even notice. I hope that there will be some utility to some one by me releasing NumberPicker under the BSD license. If you have any questions feel free to voice them in the Comments. @Adrian Firstly, I’m glad to see that you’re interesting in using my code. Secondly, I put together a test project to make sure I could implement this from scratch and I realized two errors in the XML I provided. One being that I referenced a style I did not provide, and the second being the tag wasn’t closed. Silly me! I’ve update the post to reflect these corrections. Thanks for the useful code, slight update you might want to make however is the initial integer should really be the minimum value and not a presumed 0. @Ian I disagree. In the cases where I’ve used it, all of the picker values were used in a formula, where having a zero values would not affect the formula. If it were implemented as you describe, one would have to explicitly reset all the pickers to zero for them to not affect the formula. In this case, I consider that poor usability. However, being as you have access to the source code, you could easily implement that change yourself in whichever situation you feel that functionality is appropriate. @Admin In that case it would be nice to have a method which allowed placing a true minimum to the display. I of course already did this on my side with the minimum usage as for my use a value of 0 can not be permitted. Just a usability suggestion. @Ian I would really have liked to setup some custom attributes definable in the XML layout, such as the min, max, and initial value. Any reset method then would just set it back to its initial value. If I find the time I may set about doing that, but for this release I was just hoping to get my first piece of public code out the door for those needing it. And you’re very welcome! The greatest reward is knowing that people are actually finding this useful. Hi. Just want to say thanks for releasing something genuinely useful and easy to deconstruct/learn. I’m relatively new to Java, I am writing my first Android application and stumbled upon this page. lets say I want this to be user input for a integer, I have the code inside of my app so it makes the numberpicker but how do I compare it using say a if statement to compare it to a integer? would it be possible to add something like an onChangeListener? So i could update some calculated values as soon as someone changes the NumberPicker’s value. thanks for your work, this is really useful. You reversed width and height but that, of course, doesn’t matter if using squares. Thank you for creating this component. It is the best and most lightweight solution to the problem I’ve seen! Can you tell me how do i get the values from your picker, and i want to set values on it. I have a question. If I want to get number value from another java file, how can I do this? How to get number value which is selected? Thanks for publishing this. Even in Android 2.3, I believe we are still lacking a first party control in the SDK to do this…! Your contribution really helped me out, so thank you! Sir, I am having problem using intent with your java file.What i am trying is loading an initial screen on click will lead to the number picker.Would appreciate alot if you take some time to reply me. But plz write how to use it for Java noobs like me. but the NumberPicker.java file in your src/***/ folder. edit package net.technologichron.manacalc to your own package name. For me it is com.android.GissaSiffran. In your XML file, in a tag paste the XML code (u find it in the post). 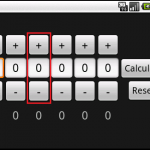 Edit net.technologichron.android.control.NumberPicker to your own package name. For me it is com.android.GissaSiffran.NumberPicker. Thank you for this. Exactly what I needed. Thanks for sharing, this solution is of great help. Thanks! The simple control I needed. Thanks A 1.000.000 for this. Very best and easy, eaven for noob as me. +1 +1 +1 +1 ! Wau, thanks for the code. Nice work!!! You save a lot of my time. How create this object in programmatically ? BTW – Jeff – thanks for the great control and code. Sorry about that. All fixed now. Hello, I use your number picker. On Samsung s3 the + and – are not in the middle of the button. I recommend calling setText() from inside increment and decrement instead of touching the variable value. Have a unified place where the value is changed. It would be grat to make min & max adjustable & introduce step setting to have an ability to increment/decrement for value different from 1. Thanks Jeff, this neat little solution has been great help. Casn we implement number picker for images. I mean images instead of numbers. Where is in project the numberpicker imported, I mean, the project should not use the ID or something like that ? @Marian I have no yet provided a good way to include this in your own projects. As it is currently, you’ll have to copy the source into your project. Using a KeyListener to prevent non-numbers from entering an EditText is a good idea. I’m going to use that because you never know what kind of crazy ways a user will find to input some data. Good post / cool picker. Could you please tell me how I can implement the reset button to set everything to 0? how to correct create instance of AttributeSet? Hello, Jeff. Can you show me complete example of use your comoponent programmatically? Thanks a lot. @Igor I’ve never tried this before. I’ll do some experimenting this weekend and get back to you. Jeff, It will be very cool! thank you! hi, how to put the numberpicker into listview, and to get it’s value? Strange enough, the sample project works perfectly on Android 4/5, but my identical implementation doesn’t (on the emulator, did not yet test on the real device), the buttons are tiny. I fixed this by changing ELEMENT_HEIGHT to approx. 170, now the buttons are nice, big and work as intended. I needed to make an e-commerce app where people can make use of +/- buttons to select the quantity of products. I modified your Number Picker to work with custom adapter in a ListView. With small modifications, the whole thing works great with listview also. Appreciate you effort.